Megan Epler Wood leads Harvard's applied research program on sustainable tourism, addressing the sustainability consequences of rapid tourism growth worldwide. Since 2002, her company, EplerWood International, has undertaken ecotourism consulting work in Asia, Africa, and Latin America guiding sustainable tourism development in high biodiversity regions. Her firm brings together businesses, communities, and governments to implement innovative, science-based solutions to managing sustainable tourism, working collaboratively with local stakeholders, academic institutions, and international development agencies. 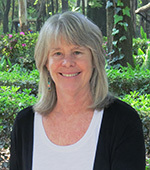 She won the Lifetime Achievement award from The International Ecotourism Society in 2013 for her significant work in this field. Epler Wood will speak on the surprising results of her new book, Sustainable Tourism on a Finite Planet , which reviews the cascading economic, social, and environmental impacts — from local to global — of the growing tourism industry, which accounts for 10% of the global economy. Her comments provide a provocative range of recommendations that demand attention to the requirements for reform in policy, business innovation, and new forms of valuing natural capital to sustain the tourism economy in the future. 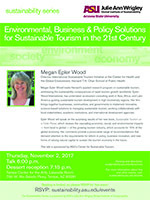 This talk is co-sponsored by ASU's Center for Sustainable Tourism. 700 W Rio Salado Pkwy.